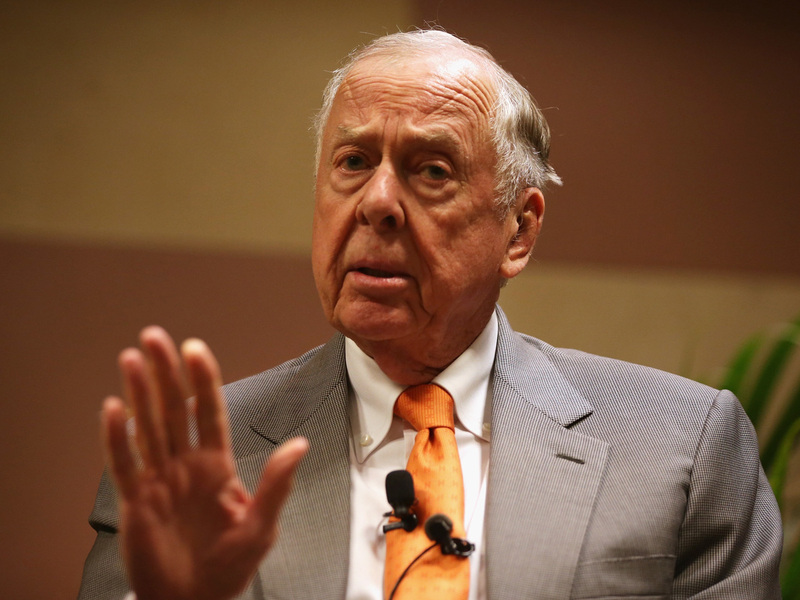 T. Boone Pickens On Donald Trump And The American Oil Industry Prospects in the industry are dim, and even the billionaire investor, who made his fortune in oil, has turned to alternative energies. Still, the self-described "realist" says they aren't the answer. T. Boone Pickens, founder and chairman of BP Capital Management, participates in a discussion during a "birthday bash" last year in Oklahoma City. Just a few months ago, the price of a barrel of crude oil reached a 30-year low. That price has inched up since then, but still, it remains 60 percent lower than it was in the summer of 2014. Oil and gas companies once flush with cash have cut exploration and pulled up to three-quarters of their rigs from the field. Meanwhile, many companies have gone under, and tens of thousands of people are out of work. The number of oil bankruptcies is hitting highs not seen since the telecom bust of nearly 15 years ago, according to Reuters. The U.S. Is Pumping All This Oil, So Where Are The Benefits? There is no question the American oil industry is in rocky straits. The real question is: Should we look at this part as part of a cycle or simply the new normal? To answer that question, NPR's Michel Martin called up T. Boone Pickens, iconic chairman of the energy hedge fund BP Capital. The billionaire oil investor recently made headlines for declaring, at a Manhattan dinner, that the industry is "dead in the water." That said, it won't be forever, says Pickens. "It'll cycle back up again, is what's gonna happen," he tells Martin. "But right now, we're dead in the water — we've lost probably 200,000 people. And so, when we start back up again, don't have the idea that we can take it back up." Pickens, a self-described "environmentalist," has recommended that the way to make OPEC irrelevant is by embracing alternative energies like wind and solar power. His company Clean Energy Fuels also builds and runs liquefied natural gas fueling stations. Still, he's not convinced that renewable energies alone are the answer. "Listen, 94 million barrels a day is what the world produces, and 70 percent of that goes to transportation fuel," he says. "Wind and solar are beautiful resources, and America has plenty of both. But neither one of them are transportation fuels. I mean, do they help? Of course they help! And they should be developed. I'm for anything American." But, he says, "I am also a realist. And the realist is, we use one unbelievable amount of energy in the world. Ninety-four million barrels a day — you can't cut that out. It's impossible." Elsewhere in the course of their conversation, Pickens talked with Martin about what he sees as the engine of the oil industry slump, as well as why he'll be supporting Donald Trump in the coming presidential election. "I've been around a long time, and I'm so thankful that the Lord has let me hang around long enough to see this. I think it's great for America." Since 1980 ... the price of oil has dropped more than in half five times. Four of the times, when that happened, the Saudis stabilized the price. It was all by oversupply of oil. 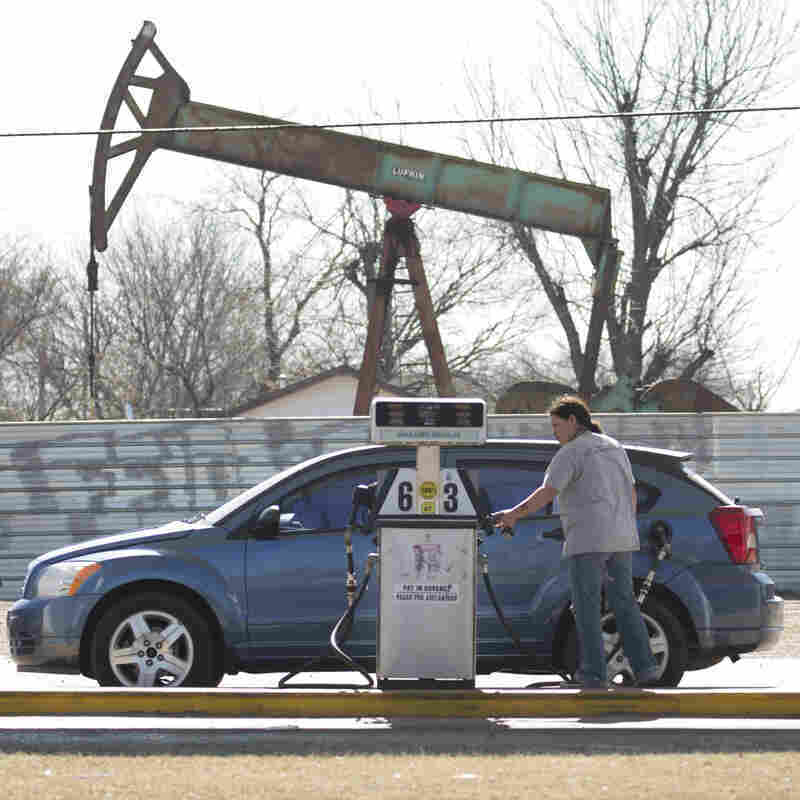 A motorist fills her car at a gas station near an oil field pumping rig in Oklahoma City. So now, fast-forward and this is the fifth time. Oil price was $100 a barrel and dropped to $26. And the Saudis made it very clear they would not be the swing producer; it's up to the United States. Why? We're the ones that oversupplied the market. The Saudis said they would not cut. They didn't. The Russians never cut. So it was up to us. And now, we went from 1,609 rigs — November 2014, I said you will cut a thousand rigs off of it real fast — today, it's down to 342 rigs. Sure, I'm gonna vote for him. They can't believe it. They cannot believe it isn't working like it has always in the past. Somebody wants change, and it happens to be a businessman that stepped up. And he's a loudmouth businessman; he gets up there, and he says, looks like and acts like a leader. And so, we're going to go with him. And that's exactly where you are. We are gonna have change. Now, you say, well, you may not like the change. I may not, but I'm a change advocate. If you go back over history, I'm always a change advocate. And so I'm ready for change, and I think Donald Trump's gonna give it to us.